There have been several instances when my visitors comment on the wrong post, but I don’t blame them. Maybe it’s because of my note in the comment section that says “For non-post related comment, please visit my Guestbook”. 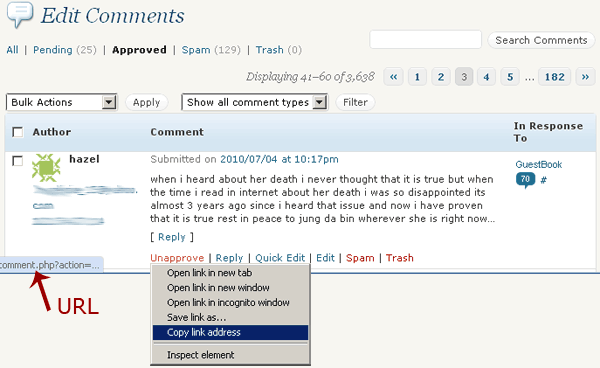 But sometimes those comments meant for other posts like “Attic Cat Jung da Bin” and other 3-year-old posts are “misplaced” in the Guestbook page. Finding a way to move the comments to their “rightful owner” or to the right post, I found a useful WordPress Tip: Move A Comment From A Post To Another article from Deluxe Blog Tips. To know the comment’s ID and the source post’s ID, go to the Edit Comments Page in your Admin Area and hover the mouse on the Approve/Unapproved link in the comments column. You will see the URL in the status bar. However if you’re using Chrome like me, you may not be able to see the full URL, so just right-click and copy the link address and paste it somewhere else, in a blank tab, notepad, etc. The comment’s ID is 12525 and the source post’s ID is 17, as indicated in p=171 and c=12525. Now we know that the destination post’s ID is 15, as seen from post=15. Choose your WordPress database, and click on the SQL tab. Type the following queries in the SQL tab and press Go, but be sure to replace it with your own comment and post IDs. WordPress will not automatically fix the comment count that’s why we have to add 1 to the destination post and delete one from the source post. If your WordPress Database Table prefix is not wp_, (such as wp_comments and wp_posts), replace wp_ with the prefix you're using. Refresh the Comments Page and you will see that the comment has been moved to the other post. This plugin allows you to move comments to a different page and to fix comment threading. I think so… maybe it&apos;s just me, but I want to move those misplaced comments to where they should be. nice tips amor, advance tutorial na to ah ! Thanks Glenn, advance ba? Akala ko late na hehe. The only thing I can execute on PhpMyAdmin is to back-up my database. And I get nervous everytime I do it. 🙂 If I do this maybe I&apos;ll pass out na. I prefer the plugin na lang siguro. As far as I can remember, it happened once lang din na may comment na nasa ibang post but I just left it as it is. Anyhow, this tip is for advanced user like you. I have 5 or more misplaced comments, mostly on old posts. Siguro if I have one, okay lang din to leave it as it is.